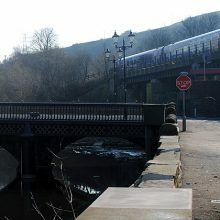 Situated on the busy Liverpool-Manchester railway link, Cumber Lane bridge was highlighted for an overhaul due to Health and Safety reasons. Both parapet walls did not meet the new legislation relating to pedestrian trafficked bridges whereby the walls had be set at a height of 196cm. This meant that the top 2 layers of existing stonework had to be carefully removed and set aside on the West elevation and replaced with new stone and associated stone copers. Each stone had to be manufactured and installed in its exact place in line with Network Rail’s site specific drawings using high grade stainless steel dowels and performance grout. Works were executed within a tight programme which included a series of Saturday and week night shifts. This was to reduce disruption to the surrounding residents, schools and most importantly the nearby Whiston Hospital which Cumber Lane Bridge provides an important road link for. Working closely with AMCO Rail, SUKR managed the rail side access element of the works by way of specifying and hiring the countries only wagon-mounted MEWP which allows up to 3 operatives to work within it’s basket any one time to allow programme deadlines to be met. The rail side element of the works required vast amounts of experience from both AMCO and SUKR to plan out the programme due to the narrow width of the bridge itself and the added risk element of working closely with the railway’s overhead electrified cables. Due to the short time frame in which the cables can be shut off, this meant that the track side works could only be completed on a Saturday evening within a shorter possession. Situated on the edge of Spinningfields in Manchester, this Grade II listed building’s facade was in desperate need of attention both internally and externally to allow this historic building to provide up to 45,000 sq ft of Grade A office space, along with over 17,000 sq ft of retail space on Manchester’s highest profile street. 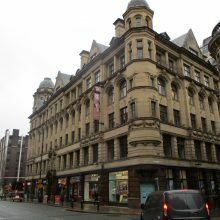 SUKR were appointed by Contract Services to carry out the restoration programme of the external facade which included Doff cleaning, pointing and stone repairs to the delaminated sandstone ashlar on window reveals, cills and entablature. The main element of works for SUKR’s skilled craftsman focused around the careful removal of all defective stone work; followed by the installation of stainless steel dowels and wire, set into pre-drilled resin filled holes to allow the specified hand placed repair mortar to progressively restore and shape the repairs back to their original profile. All of the contracted works were completed on programme, within budget and to the satisfaction of the client and appointed Architect. Chester Railway Station is a busy Grade II* listed building at the centre of historic Chester. 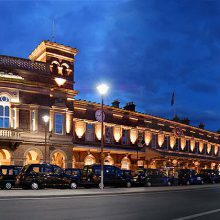 The station is under going a £10m restoration & refurbishment programme. SUKR was instructed to carry out the stone restoration of the window and door heads situated on the main platforms. This involved careful restoration and cleaning of the stonework, using traditional methods. Due to the success of this project SUKR have been awarded contracts to carry out similar works to a number of other stations. The Grade II Listed County Bridge, Sowerby Bridge forms part of the busy, vital link from the Sadddleworth M62 junction to Halifax. The stone and steel bridge structure stretches over the river Calder in a three span formation. The bridge was in need of emergency structural repairs due to its age and also the vast amount of traffic it carries on a daily basis. During the works it was essential that the bridge remained open at all times. SUKR worked closely with Barhale & Mouchel’s the engineers advising of the best repair methods to replace missing stone from the bridge faces and carry out structural repairs. 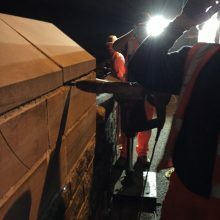 Stone was sourced locally and as part of the works SUKR also carried out a full pointing package to the faces and under arches of the bridge using rafts. This was done with a heritage lime mortar as specified by conservation officers. The historic Trencherfiled Mill is a Grade II listed building in the heart of Wigan. 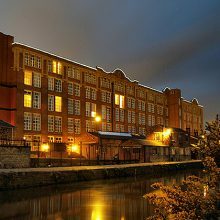 SUKR acted as the principal contractor responsible for the restoration of the mill facade. The building has now been transformed into luxury waterside apartments by Stewart Milne Homes. Working closely with local conservation officers & architects, SUKR sympathetically restored and enhanced the delicate brick, stone & terracotta facades into what are now an award winning project and a big part of the transformation of Wigan’s Heritage & Culture Centre. Britannia Mill is a Grade II listed building at the University of Derby. SUKR worked on the restoration of the large facades. The mill has now been transformed into one of the universities most prominent buildings. SUKR were instructed by J Tomlinson to carry out the 1300 /m2 facade restoration works which included, brick cleaning, raking-out & repointing, Helifix structural repair, stone repairs to window heads & cills and the restoration of the original entrance in the photo. SUKR finished the project on time and on budget and have been commended on the quality of work completed. Ormskirk Railway Station is a Grade II listed building used by hundreds of rail users every day. 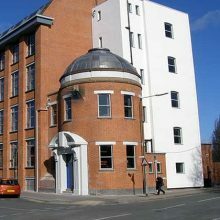 SUKR was instructed to carry out the full restoration of the exterior of the building. 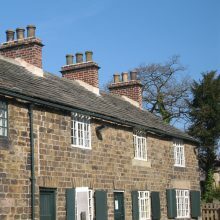 This involved careful restoration of the exterior damaged brick and stonework, reinstatement of chimney stakes and the rebuilding of window arches. 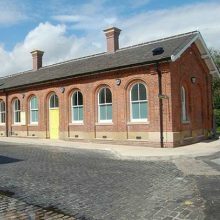 The station won an award from the Association of Community Rail Partnerships in September last year in recognition of the restoration and won the accolade at the National Railway Heritage Awards in the Modern Railways Restoration category. Due to the success of this project SUKR have been awarded contracts to carry out similar works to the following stations: Chester, Rock Ferry, Accrington, Swansea, Huddersfield & Hartlepool.